Recent advances in acid–base physiology and in the epidemiology of acid–base disorders have refined our understanding of the basic control mechanisms that determine blood pH in health and disease. These refinements have also brought parity between the newer, quantitative and older, descriptive approaches to acid–base physiology. This review explores how the new and older approaches to acid–base physiology can be reconciled and combined to result in a powerful bedside tool. A case based tutorial is also provided. During the past 5 years, numerous publications have examined various aspects of acid–base physiology using modern quantitative acid–base chemistry. These studies have refined our understanding of the basic control mechanisms that determine blood pH in health and disease, and have described the epidemiology and clinical significance of acid–base imbalances in far more detail than was previously possible. Furthermore, these refinements have brought into parity quantitative and descriptive approaches to acid–base physiology, and permit translation of the 'old' into the 'new'. Indeed, these advances have established that the modern (quantitative) and traditional (descriptive) approaches are, in fact, easily interchangeable at the level of their most basic elements, with a little mathematical manipulation. This 'interchange' has in turn resulted in an explication of the limitations of each approach and has revealed how a combined approach can be used to achieve a more complete understanding of clinical acid–base physiology. These new insights have further called into question some basic clinical interpretations of acid–base physiology while at the same time supporting the underlying chemistry. For example, it is now possible to understand and apply the variables of strong ion difference (SID) and total weak acids (ATOT) entirely within the context of Bronsted–Lowry acid–base chemistry [1–5]. However, it remains difficult to reconcile how alterations in plasma pH can be brought about by direct manipulations of hydrogen or bicarbonate ions, as the descriptive approaches suggest (although do not require), when they are dependent variables according to quantitative acid–base chemistry. Newer approaches such as ion equilibrium theory [1, 2] can perhaps reconcile these differences by not requiring independent variables, but it is likely that advances in our understanding of pathophysiology will favor one interpretation or the other. For example, the discovery of genetic polymorphisms that alter the function of chloride channels being associated with renal tubular acidosis  favors the quantitative explanation. Nevertheless, observations detailed using descriptive approaches are no less valid. 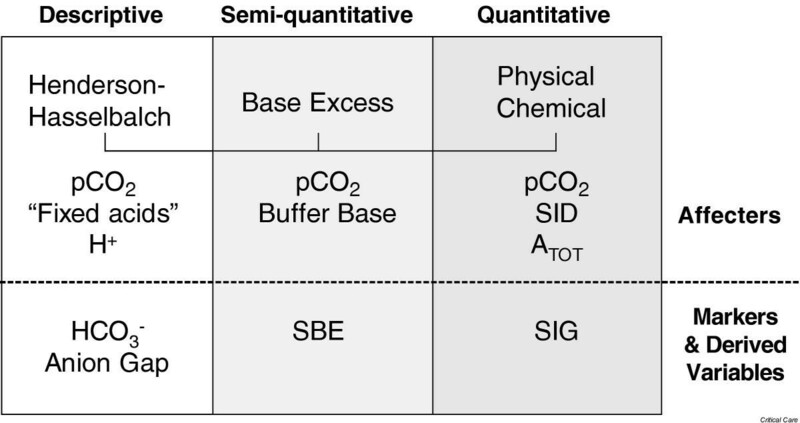 One way to unify acid–base physiology is merely to acknowledge that descriptive indices such as standard base excess (SBE) and the Henderson–Hasselbalch equation are useful for describing and classifying acid–base disorders, whereas quantitative indices such as SID and ATOT are more useful for quantifying these disorders and for generating hypotheses regarding mechanisms. This review explores how acid–base 'reunification' is possible and even desirable, and how a unified approach can be more powerful than any of its parts. This unified field answers many stubborn questions and simplifies bedside interpretation to the point that every practising intensivist should be aware of its essential components. Finally, a detailed review of a complex yet typical case is used to reinforce these concepts. The continuum of approaches to understanding acid–base physiology. All three approaches share certain affecter elements and all use markers and derived variables to describe acid–base imbalance. ATOT, total weak acids; PCO2, partial carbon dioxide tension; SBE, standard base excess; SID, strong ion difference; SIG, strong ion gap. where C is the total concentration of carbonate species proton acceptor sites (in mmol/l), Ci is the concentration of noncarbonate buffer species i (in mmol/l), is the average number of proton acceptor sites per molecule of species i, and D is Ricci's difference function (D = [H+] - [OH-]). Thus, Eqn 1 may be regarded as a master equation from which all other acid–base formulae may be derived . It is no wonder, in terms of describing acid–base abnormalities and classifying them into various groups, that the three widely accepted methods yield comparable results . Importantly, each approach differs only in its assessment of the metabolic component (i.e. all three treat partial carbon dioxide tension [PCO2] the same). These three methods quantify the metabolic component by using the relationship between HCO3- and PCO2 (method 1), the SBE (method 2), or the SID and ATOT (method 3). All three yield virtually identical results when they are used to quantify the acid–base status of a given blood sample [1, 4, 8, 9], with an increasingly complex rule set going from method 3 to method 1 [10, 11]. In quantitative acid–base chemistry (method 3), a complete 'rule set' is provided in the form of equilibrium equations [12, 13], so the approach is easily adapted to modern handheld computer devices  and more sophisticated graphical interfaces . However, this does not in itself necessarily make the approach any better [4, 5], although it is by definition more transparent and therefore more easily reproduced. The difficulty with the quantitative approach comes from the fact that several variables are needed, and when they are absent and assumed to be normal the approach becomes essentially indistinguishable from the more traditional descriptive methods. Of course, this only applies to quantifying and classifying an acid–base disorder. The quantitative approach has important implications for our understanding of mechanisms, leading to conclusions that are at odds with more traditional thinking (e.g. viewing renal tubular acidosis as 'chloride channelopathies'). However, in the absence of specific experimental data, the method can only imply causality – it cannot establish it. Furthermore, all three approaches predict the exact same changes in all of the relevant variables and, because these changes occur nearly instantaneously, determining which variable is causal is extremely difficult. An often used analogy is that the naked eye can observe the movement of the sun in reference to the Earth, but without additional observations (via Galileo's telescope) or mathematical models (ala Copernicus) it is impossible to say which body is in motion [16, 17]. In the case of acid–base physiology multiple variables 'move', making the analysis that much more difficult. In the end, all approaches to acid–base analysis are just tools. Their usefulness is best evaluated by examining the predictions that they make and how well they conform to experimental data. For example, by using only the Henderson–Hasselbalch equation a linear relationship between pH and log PCO2 should exist, but actual data demonstrate nonlinear behavior . In order to 'fit' the Henderson–Hasselbalch equation to experimental data, terms for SID and ATOT must be added [2, 18]. Here, K1' is the equilibrium constant for the Henderson–Hasselbalch equation, Ka is the weak acid dissociation constant, and S is the solubility of CO2 in plasma. Similarly, one can predict changes in plasma bicarbonate resulting from addition of sodium bicarbonate using its estimated volume of distribution (Vd). Under normal conditions the Vd for bicarbonate in humans has been estimated to be 40–50% of total body water . However, the calculated Vd for bicarbonate changes with changes in pH , and Vd changes differently with respiratory versus metabolic acid–base derangements . Treating bicarbonate as a dependent variable and predicting the changes with sodium bicarbonate as a result of the effect on sodium on SID requires none of these complicating rules and exceptions, and might therefore be viewed as much simpler. However, Eqn 4 still yields results that are slightly unstable as PCO2 changes (Fig. 2). Furthermore, the equation assumes normal ATOT. When albumin or phosphate is decreased – a common scenario in the critically ill – Eqn 4 will result in even more instability (Fig. 2). Recently, Wooten [4, 5] developed a multicompartment model using quantitative techniques and suggested a correction for SBE that results in a formula for SBE that agrees much more closely with experimental data in humans. Albumin is expressed in g/dl and phosphate in mg/dl. Thus, the techniques previously developed to calculate parameters that describe physiological acid–base balance in single compartments have now been extended to multicompartment systems. Furthermore, the equations for multicompartment systems have been shown to possess the same mathematical inter-relationships as those for single compartments. Wooten also demonstrated that the multicompartment form of the Van Slyke equation (Eqn 5) is related in general form to the traditional form of the Van Slyke equation (Eqn 3), and that with the multicompartment model modern quantitative acid–base chemistry is brought into the same context as the BE method . In this way, SBE can be seen as the quantity of strong acid or base required to restore the SID to baseline, at which pH is 7.40 and PCO2 is 40 mmHg. Experimental data have already borne out this relationship in that the change in SBE is essentially equal to the change in SID across a vascular bed (when there is no change in ATOT . If ATOT changes then SBE still quantifies the amount of strong acid or base required to change the SID to a new equilibrium point at which pH is 7.40 and PCO2 is 40 mmHg. This relationship between SBE and SID is not surprising. Stewart's term SID refers to the absolute difference between completely (or near completely) dissociated cations and anions. According to the principle of electrical neutrality, this difference is balanced by the weak acids and CO2 such that SID can be defined either in terms of strong ions or in terms of the weak acids and CO2 offsetting it. Of note, the SID defined in terms of weak acids and CO2, which has been subsequently termed the effective SID , is identical to the buffer base term coined by Singer and Hastings  over half a century ago. Thus, changes in SBE also represent changes in SID . Metabolic acid–base disturbances can be brought about by changes in strong ions or weak ions. These ions can be routinely measured (e.g. Cl-) or not (e.g. ketones). The ones not routinely measured are referred to as 'unmeasured ions'. Many years ago it was impractical to measure certain ions such as lactate, and it remains impractical to measure others such as sulfate. Thus, the literature contains a confusing array of information regarding the magnitude of unmeasured ions (usually anions) and techniques to estimate them. Because of its low and narrow extracellular concentration, K+ is often omitted from the calculation. Respective normal values with relatively wide ranges reported by most laboratories are 12 ± 4 mEq/l (if K+ is considered) and 8 ± 4 mEq/l (if K+ is not considered). The 'normal AG' has decreased in recent years following the introduction of more accurate methods for measuring Cl- concentration [33, 34]. However, the various measurement techniques available mandate that each institution reports its own expected 'normal AG'. Some authors have raised doubts about the diagnostic value of the AG in certain situations [35, 36]. Salem and Mujais  found routine reliance on the AG to be 'fraught with numerous pitfalls'. The primary problem with the AG is its reliance on the use of a 'normal' range produced by albumin and to a lesser extent by phosphate, as discussed above. These constituents may be grossly abnormal in patients with critical illness, leading to a change in the 'normal' range for these patients. Moreover, because these anions are not strong anions their charge will be altered by changes in pH. This has prompted some authors to adjust the 'normal range' for the AG by the patient's albumin and phosphate concentration. Each 1 g/dl albumin has a charge of 2.8 mEq/l at pH 7.4 (2.3 mEq/l at 7.0 and 3.0 mEq/l at 7.6), and each 1 mg/dl phosphate has a charge of 0.59 mEq/l at pH 7.4 (0.55 mEq/l at 7.0 and 0.61 mEq/l at 7.6). Thus, in much the same way that the corrected SBE equation (Eqn 5) updates BE to allow for changes in ATOT, the AG may be corrected to yield a corrected AG (AGc) . The choice of formula is determined by which units are desired. Here the AGc should approximate zero. This is because the terms for albumin and phosphate approximate A- (the dissociated portion of ATOT). When AGc was used to examine the presence of unmeasured anions in the blood of critically ill patients, the accuracy improved from 33% with the routine AG (normal range = 12 mEq/l) to 96% . This technique should only be used when the pH is less than 7.35, and even then it is only accurate within 5 mEq/l. Note that some authors have chosen to 'correct' the AG by increasing the calculated value rather than adjusting its expected range. Here the same (or slightly simplified equations) are used to increase the AG toward the traditional range rather than to decrease it toward zero. Either approach would be acceptable, but if the objective is to quantify unmeasured anions then the former may seem unnecessarily cumbersome because it requires the additional step of subtracting a normal value. However, the purpose of the AG is to detect the presence of unmeasured ions (e.g. ketones, salicylate), and AGc will not consider abnormalities in other 'measured' ions such as Mg2+ or Ca2+, and the correction for albumin and phosphate is merely an approximation. To be more exact, one can calculate the strong ion gap (SIG) [37, 38]. Importantly, all the strong ions are expressed in mEq/l and only the ionized portions of Mg2+ and Ca2+ are considered (to convert total to ionized Mg2+, multiply by 0.7). Note also that we do not consider lactate as unmeasured. Because the concentration of unmeasured anions is expected to be quite low (< 2 mEq/l), the SIG is expected to be quite low. However, some investigators have found elevations in SIG, particularly in critically ill patients, even when no acid–base disorder is apparent [39–42]. By contrast, results from studies in normal animals [38, 43] and values derived from published data in exercising humans  put the 'normal' SIG near zero. There is even a suggestion that critically ill patients in different countries might exhibit differences in SIG. In the USA [40, 44], Holland  and Thailand  the SIG is about 5 mEq/l, whereas studies from England  and Australia  report values in excess of 8 mEq/l. The difference may lie with the use of gelatins in these countries , which are an exogenous source of unmeasured ions . In this scenario the SIG is likely to be a mixture of endogenous and exogenous anions. Interestingly, previous studies that failed to find a correlation between SIG and mortality were performed in countries that use gelatin based resuscitation fluids [41, 42], whereas studies of patients not receiving gelatins [40, 45, 48] or any resuscitation at all  found a positive correlation between SIG and hospital mortality. Indeed, Kaplan and Kellum  recently reported that preresuscitation SIG predicts mortality in injured patients better than blood lactate, pH, or injury severity scores. Similar results were also obtained by Durward and coworkers  in pediatric cardiac surgery patients. Although that study was done in England, gelatins were not used. Thus, the predictive value of SIG may exceed that of the AG, but it may vary from population to population and even between institutions. As such, estimating the SIG from the AG, after correcting for albumin and PO4, and after subtracting lactate (i.e. AGc), may be a reasonable substitute for the long hand calculation [7, 39, 46]. Together with the updates for SBE discussed above, conversion between the descriptive approaches to acid–base balance using HCO3- or SBE and AG and the quantitative approach using SID and SIG should be fairly straightforward; indeed, they are (Table 1). Note that the translation from traditional to physical chemical variables is not a one to one exchange. Rather, the variable in the traditional column corresponds to a similar variable in the physical chemical column (see comments for further explanation). Adapted with permission from Kellum . A-, nonvolatile weak acid buffers; ABE, actual base excess; AH, nondissociated weak acid; ATOT, total weak acids; PCO2, partial carbon dioxide tension; SBE, standard base excess; SID, strong ion difference; SIDa, apparent strong ion difference; SIDe, effective strong ion difference; SIG, strong ion gap; X-, unmeasured anions - unmeasured cations. If acid–base analysis can be reunified and BE and AG updated, then it should be fairly easy to take the quantitative approach to the bedside – even without a calculator. In fact, this is the approach that I have been using for several years but it is now possible to be much more precise, given the advances of the past few years. To see how this works, let us consider a complex but all too common case (Table 2). This patient presented (middle column) with severe metabolic acidosis, as indicated by the SBE of -20 mEq/l or by the combination of a low HCO3- and PCO2. However, is this a pure metabolic disorder or is there a respiratory component as well? Table 3 shows the typical patterns found in patients with simple acid–base disorders. A metabolic acidosis should be accompanied by a PCO2 that conforms to both formula ([1.5 × HCO3-] + 8) and (40 + SBE), and indeed the PCO2 of 20 mmHg fits this expectation. So, we can be assured that this is a pure metabolic acidosis, but what is the cause? A 55-year-old female with a history of hypertension and chronic renal insufficiency presents with fever, chills and arterial hypotension (blood pressure 80/40 mmHg). She is resuscitated with approximately 140 ml/kg of 0.9% saline solution. The lactate value from 1 month ago is unknown and assumed to be normal. Laboratory values are shown in American units (SI units in parentheses). ABG, arterial blood gas (pH/PCO2/PO2); AG, anion gap; AGc, corrected anion gap; SBE, standard base excess; SBEc, corrected standard base excess; SIG, strong ion gap. Adapted with permission from Kellum . PCO2, partial carbon dioxide tension; SBE, standard base excess. The first step in determining the likely etiology should be to determine the type of causative anion. Specifically, is the metabolic acidosis due to measured or unmeasured anions? The AG is 20 mEq/l so this is a positive AG acidosis, and lactate is elevated so this is a lactic acidosis. However, are unmeasured anions also present? Is there a hyperchloremic acidosis as well? Could there be metabolic alkalosis? An advantage of quantitative acid–base physiology is its ability to determine the size of each effect. Using data obtained 1 month before the current presentation, one can see that there was already a metabolic acidosis even then, and that the SID – whatever value it was – was approximately 8 mEq/l lower than at equilibrium (the point at which pH = 7.4 and PCO2 = 40). At that time the 8 mEq/l was accounted for by approximately 4 mEq/l of unmeasured anion (both AGc and SIG are approximately 4), and the remaining 4 mEq/l was, by definition, hyperchloremic. Note that the plasma Cl- concentration need not be increased; indeed, in this case the 107 mmol/l is still within the normal range. However, for the concentration of Na+ at that time (130 mmol/l), the Cl- was certainly increased. The diagnosis of hyperchloremic acidosis is made by exclusion (i.e. metabolic acidosis not due to lactate or unmeasured anions). This combination of hyperchloremic and SIG acidosis is common in renal failure  and, given that this patient has significant chronic renal insufficiency, it is likely that this is the cause. At presentation, however, she now has a SBE that is roughly 10 mEq/l lower than it was 1 month ago. The decrease appears to have resulted from lactate (increased by 4 mEq/l) and other anions (SIG increased by 5 mEq/l). It is tempting to attribute the increase in lactate to shock, but many other etiologies have been identified for hyperlactatemia that could be responsible for the increase in this patient . The increase in SIG could be due to a variety of factors, including poisons (e.g. salicylate, methanol, etc. ), ketones, and other organic acids such as sulfate [7, 11]. Under the appropriate clinical conditions, these diagnoses should be perused. However, sepsis  and shock  also appear to increase SIG through unknown mechanisms, and this may well be the cause in this case. Furthermore, the SIG before resuscitation appears to correlate (inversely) with outcome [44, 48]. There does not appear to be any evidence of additional hyperchloremic acidosis because the change in SBE is almost completely explained by lactate and SIG. Neither is there evidence of metabolic alkalosis, which would be manifest by a SBE that was higher (less negative) than predicted from the SIG and lactate. These complex acid–base disorders can only be unmasked with the use of quantitative techniques or, at least, semiquantitative techniques using SBE, as illustrated here. Finally, this patient was resuscitated with a large volume of saline solution (SID = 0). The net effect of this solution on blood pH is determined by the opposing effects of decreasing SID (acidifying) and decreasing ATOT (alkalinizing). Because the strong ions have a somewhat greater impact on pH than do weak acids (which are weak after all), the net effect is an acidosis [43, 51]. Thus, in the final column of Table 2 we have an SBEc of -20 mEq/l. This increased acidosis is due to an increase in Cl- relative to Na+ (approximately 5 mEq/l change) and an increase in SIG (1 mEq/l). These effects are partially offset by a decrease in lactate (2 mEq/l) and a decrease in ATOT (approximately equal to a 2 mEq/l decrease). Thus, the 2 mEq/l worsening in SBEc is explained by each of these components (5 + 1 - 2 - 2 = 2). Recent advances in whole body acid–base physiology as well as epidemiology have resulted in a much clearer picture of metabolic acid–base disturbances in the critically ill and injured. It is now possible to 'reunify' traditional descriptive approaches to acid–base balance with modern quantitative techniques. This unified approach is both simple and transparent and can be easily used at the bedside. It should also aid in accessing and interpreting the bulk of the clinical literature. As has already been the trend, newer studies of acid–base physiology will no doubt take advantage of quantitative techniques while continuing to report more traditional variables. JK has filed a patient disclosure for a software product related to this field (in general).